In a small classroom at Hilltop High in the Mission District Ronnae Coleman and nine other teenage girls are concentrating on pinning down a frog’s leg. She first stretches the leg, then pins down the foot. Then with her goggles on she cuts the frog’s stomach open. Coleman looks for the eggs. Unlike most high school seniors Coleman and her friends include taking care of a newborn. But like other seniors, the students are also planning to go to college in the fall. Take the 17-year-old, who is now an aspiring lawyer. She has a two-year-old daughter and plans to attend San Francisco State in the fall. But before joining Hilltop, the only program in the district exclusively for high school mothers, she failed to attend school. The 17-year-old said she lived in a difficult home environment and got pregnant at 15. Soon after she found herself in jail for drugs. Hilltop, she said, changed that. “If I didn’t have Hilltop I would probably still be on the streets, I would have given my baby up for adoption,” she said. Jessica Campos, 18, said she plans to attend San Francisco City College this fall then transfer to San Francisco State University. After a 14-year-decline, U.S. teenage pregnancy rates have risen for a second year in a row, according to a report issued earlier this year. Nationally, the birthrate for 15 to 19 year olds rose 1.4 percent in 2007. This followed a 3.4 percent rise in 2006, according to The National Center for Health Statistics report released earlier this month. For the last five years Hilltop’s numbers have stayed steady at around 100 students. And, the number of mothers or pregnant high school students has stayed steady at about 120 students according TAPP. 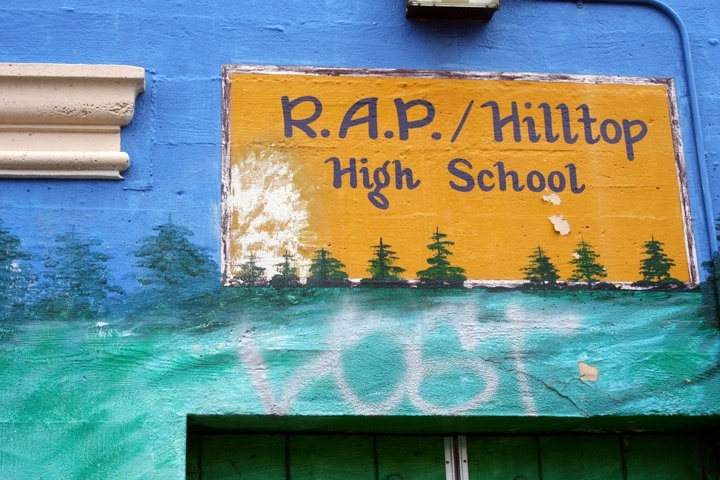 Students at Hilltop have the same academic track as any SFUSD high school student. There are four full-time teachers, and three on-site nurseries. Also housed at Hilltop is The Teenage Pregnancy and Parenting Project, which provides education and direct case management to support all pregnant and parenting students in San Francisco. At Hilltop, students have access to on-site childcare. Hilltop is not the only option for pregnant teens within the SFUSD, the girls can stay at their high school, but most chose not to. “After you deliver you know your baby is going to have a space available at the nursery and you can continue going to school,” said Diaz. “I nurse my baby seven to nine times during a day,” said 17-year-old Anita Leyva who checks in on her baby in between classes. She and her boyfriend Francisco live two blocks from the school. He says his parents are not in the United States and cannot help the couple raise their four-month old daughter Karla. Chane Bowser, a senior at Hilltop, said her favorite class is also parenting. She says eight-month-old Zahmayah, motivates her to stay in school. Next fall Bowser says she’ll attend City College. “Nobody can do anything on their own, if you’re an adult you know more but teens don’t really know as much as adults so we need more resources,” said Bowser. Aletha Bowser, Chane’s mom said she was disappointed and shocked when she found out her daughter was pregnant at 17. She said she had her first child at 19. Ann Darling, the science teacher said the school is necessary. “This school is important because it allows a pregnant or parenting teenager to continue their education,” said Darling. “We do it with a little more nurturing and with a little more family atmosphere. We know each one of the students and each of their problems and they can adjust and became flexible and feel the family atmosphere and be successful.” She says she sees Ronnae Coleman as a future pediatrician not a nurse. Excellent story! The young women in this story exhibit amazing resiliency and I wish them the best of luck. Hilltop sounds like a very special place. This is wonderful. It is so refreshing to hear stories in the news and media that are success stories. Every thing we hear any more is so negative. It is so great to hear positive things and to know there are still good people in this world that care enough about others to do whatever it takes to help them a long the way. That’s what life is all about. I have an interest in this sort of school as far as being able to help in some way. I am a RN with 18 years of materninty nursing and looking for some way to be come involved in helping these teenage mom’s succeed and be great moms at the same time.If any one knows of somthing like the Hilltop school in the Southeast area, please let me know. I live in Ohio, in Greene county and I really wish they had that kind of school here.